This is an awesome tasting, healthier version of a pumpkin pie latte than you will find in your local coffee shops. You may adjust the spicing and the liquid amounts as desired. Enjoy! Whipped cream – see recipe below. Mix the pumpkin, tablespoon of milk, spices and maple syrup in a small saucepan. Whisk well. Add the coffee and whisk. Heat to desired temperature. In a separate saucepan, heat the milk. Heat until JUST hot, not boiling. Froth with a handheld frothier. If you do not have, place in blender or in mixer to froth. Divide the coffee mixture into two large mugs and pour the foamed milk over it. 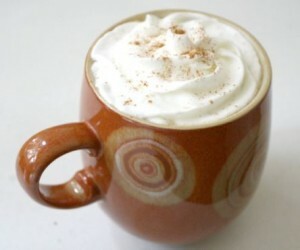 Top with whipped cream and sprinkle with cinnamon or garnish with a cinnamon stick. *We use organic raw milk products whenever possible and **freshly grind our coffee from organic and/or fair trade coffee beans. Most coffee is heavily sprayed with pesticides. In a chilled bowl, combine whipping cream, sugar, and vanilla. Beat with chilled beaters on medium speed until soft peaks form. Makes 1 cup. Yes, it is that simple! !